More than 40 days have passed since the Stockholm Agreement. Hizb ut Tahrir at the time explained that it was concluded under US pressure to rescue its Houthi agents, showing the seriousness of America in stopping the war in Yemen after setting the stage for its convening. This is because America founded the pressuring public opinion by raising the voice highlighting the humanitarian motives and the tragedies in Yemen of famine, diseases of children, the dead and wounded, etc, as a result of wars. As if these things happened today! However, Britain, the long-standing colonialist in Yemen, wants to make it a gateway to take and respond to the agreement on the pretext of how to monitor, implement and withdraw to prolong it through the Security Council Resolution 2451, which it submitted and voted for unanimously by the Security Council on 21/12/2018 after US amendments. The conflicting parties on the land of Yemen are not concerned of the number of people killed and the size of the destruction in its structure, but what is important to the colonial conflicting parties is to achieve their interests only. In this regard, the United Nations envoy to Yemen the British Martin Griffith, confirmed that the timetable for the implementation of the Swedish agreement on the city of Hodeidah west of Yemen and the exchange of prisoners, are extended, justifying the extension is due to “difficulties on the ground” although Britain is the one that has an interest in extending it as mentioned previously. In addition it wants to turn the international community against the Houthis and put at stake, especially because they are famous for bigotry and lack of experience in politics, and they are famous for breaking the contracts and agreements with their enemies. In his interview with the Saudi newspaper, “Asharq Al Awsat”, Griffith confirmed that the Dutch General Patrick Cammaert, the chief UN observer in Yemen, would leave office but refrained from giving the reasons. The Secretary-General to the United Nations Antonio Guterich has chosen on Monday the retired Danish General Michael Lollesgaard to replace the Dutch general to lead the UN observer mission in Yemen, who was appointed only a month ago, according to diplomatic sources to AFP, and thus an international observer will leave and comes another to no avail, leaving only dodgy and deceitful words of hope like a mirage of a lowland that the thirsty one think its water! What confirms what Hizb ut Tahrir said at the time regarding the movement forth and back in the implementation of the agreements and the withdrawal and its method, is this great disagreement and confusion about understanding the text of the Stockholm agreement regarding the withdrawal of troops from the city of Hodeidah and its ports and who is responsible to take it over. 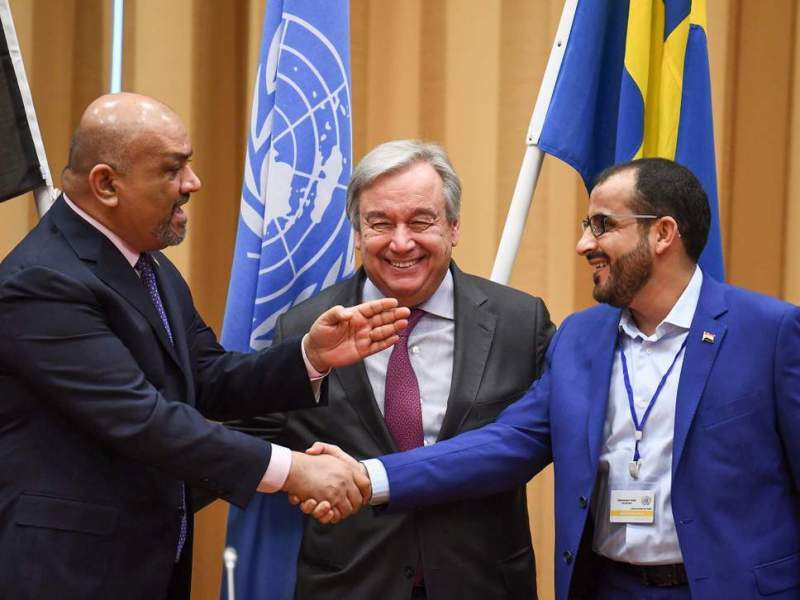 The Hadi government stresses the need to implement the Stockholm agreement and the withdrawal of the Houthi militias from the city and ports of Hodeidah and to hand it over to the local authorities – according to Yemeni law – as stated in the text of the agreement, while the Houthis are demanding the implementation of the agreement and see that the authorities and local forces designated by them and their loyalists are the ones responsible for this. The play was to hand over security of Hodeidah and ports to the coast guards, whom they appointed. So America remained silent over this, the loyalist to Britain objected- Hadi, the UAE and their followers. Thus, the British UN envoy Martin Griffith placed in the Stockholm Agreement as surprises that prolong the war and the conflict in the interests of his country Britain, therefore to greatly impact Saudi Arabia to stop its campaign against British agents after they arrested their agents and excluded them from the government and put their interests in danger and at risk of demise. Therefore, we can say that America and its allies in the region, especially Saudi Arabia, are serious about ending the Yemeni war today and head to negotiations leading to a significant share of Yemen’s rule for the Houthis. But this American orientation does not mean that America is capable of achieving it under the great British influence in Yemen. The situation is expected to continue to go back and forth; on the American side, it wants to close the military theatere, especially in Hodeidah and its ports and then go to political solutions and keeping the voice of the Houthis heard as in Hodeidah. On the British side, it finds pretexts to continue fighting to achieve as much as possible by weakening the Houthis and to silence their voice in Hodeidah before heading for a political solution, which is in fact the wrong solution, as it is a disaster for the people of Yemen and a betrayal of Allah and His Messenger and the believers. O People of Yemen! The United Nations that you know, and who still does not know it should ask about it the calamities of Muslims, it is a history of criminality and colonialism and a tool to sabotage the country and the corruption of slaves, as well as it works to prolong conflicts and wars to exploit through it the suffering of the people of Yemen. And to collect donations in their name, this year it wants to collect 3 billion dollars to steal most of it, as it stole you before and gave you the bits and pieces. What is more criminal is that that they use this aid to spread their venom and malicious culture in Yemen, exploiting people’s poverty and destitution through their malicious organizations, and this is no longer hidden to those who think. Should you not return therefore to your Iman and wisdom that obliges you to stop criminals and oppressors, and renounce the Kuffar and end the colonists’ influence and establish the Khilafah Rashida (guided Caliphate) state on the method of Prophethood, by Allah’s law alone is your salvation and your success and by it alone is your liberation from what you are in.